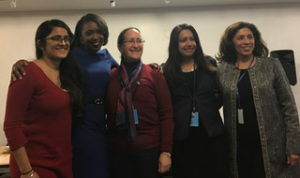 In March of 2018, a delegation of six from International Action Network for Gender Equity and Law (IANGEL) joined more than 4,000 human rights defenders from 120 countries at the United Nations (UN) headquarters in New York for the 62nd session of the Commission on the Status of Women (CSW 62). From March 12 to 23, representatives of UN entities, member states and -accredited non-governmental organizations (NGOs) met to discuss the priority theme of the year; “empowering rural women and girls”. The session included a number of events for advocates on strategies for enhancing the protection of women’s human rights and as well as facilitating global connections between the UN, NGOs, and civil society. At the opening of the session, members of the IANGEL delegation had the opportunity to attend a town hall meeting with UN Secretary-General António Guterres, a proud feminist. After outlining a roadmap to achieve full gender parity in employment within the UN by 2028, Guterres heard concerns from civil society representatives. For example, a representative from the World Young Women’s Christian Association questioned the choice to hold CSW 62 in New York, when discriminatory U.S. travel bans prevented many women from attending. Other audience members emphasized the importance of addressing injustices faced by LGBTI, indigenous, and widowed women who are often overlooked in global advocacy efforts. While the agreed conclusions of CSW 62 specifically acknowledge indigenous and widowed women, Guterres admitted “we have a hard road in front of us,” in addressing unjust mechanisms that target LGBTI women around the world. In addition to meetings held by the UN and its member states, CSW 62 features numerous parallel events from select NGOs, including IANGEL. On March 14, 2018, IANGEL presented a panel discussion on using volunteer lawyers to improve the lives of rural women, followed by a networking session. Nancy Newman, IANGEL founder and President, emphasized the transformative role of pro bono lawyers in disseminating information on topics such as rights and remedies. Newman was joined by President of the San Francisco Commission on the Environment Elmy Bermejo and IANGEL Board Member Danielle J. Nicholson. IANGEL board member Shruti Rana, professor at the Indiana University School of Global and International Studies, moderated the panel. Rana noted that a plurality of local, customary and national laws can prevent formal equality from becoming equality in practice. For rural women, legal guarantees of equality are often “just words on a page.” In theory, Nicholson said, governments should uphold laws in line with CEDAW, but women do not always know their legal rights are violated when they face injustice. Newman and Bermejo noted the importance of educating rural women and girls to become their own experts in policy to combat enforcement gaps. The panel agreed that education is most powerful when it is from the local community, which is why pro bono lawyers should partner with community organizations. The audience of about 40 people was deeply engaged throughout the presentation, and remained in discussion with the panelists for over an hour after the event concluded—until the group was forced to disband by the closing of the building! 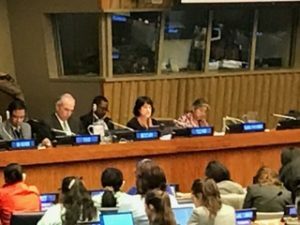 On March 16, 2018, IANGEL board member Tzili Mor was featured in an interactive expert panel presented by UN Women to the assembled delegations of the United Nations, on the “Challenges and opportunities in achieving gender equality and empowerment of rural women and girls.” The chair’s summary of the discussion with links to the papers presented by each panelist was posted as part of the official record of CSW 62, here. Mor is an internationally recognized expert on women’s land rights and spoke eloquently on the challenge of empowering women when local laws, customs, and legal frameworks are often hostile to their rights to own and inherit property. IANGEL delegates attended a variety of side and parallel events, including panels on combatting gender based violence, women peace builders and engaging legal mechanisms to empower rural woman and girls. 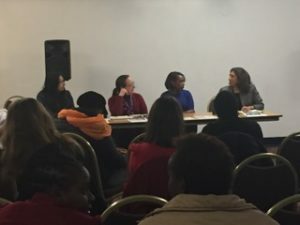 A panel hosted by Women Enabled International on advancing the rights of historically excluded women and girls encouraged training a local vanguard to engage their own communities. Panel member Lizzie Kiama, Director of Gender and Disability at This-Ability Consulting in Nairobi, Kenya, said that changes in culture begin in local communities and governments.